The man who executes My counsel, from a far country. I will also bring it to pass. I will also do it. God has always had a purpose for our life. What God does and does not do for us has purpose. It will help us in our walk with God if we will surrender to the fact that God has a plan greater then we know. He knew I had an appointment with destiny, and I somehow sensed that God had a purpose for my life. I went to church until my mom died when I was seven. When I was a teenager I would sometimes watch Oral Roberts on Sunday morning, and I knew “something good was going to happen to me”. Also, as a teenager I would go to the tent meetings across the street from Sunrise Mall and heckle the preachers. When I was in boot camp I accepted Jesus, so God was there but I wasn’t committed, I was not seeking Him. Life and God’s Word has shown me that everyone is predestined to accomplish certain things for the Lord. Romans 9:21, Does not the potter have power over the clay, from the same lump to make one vessel for honor and another for dishonor? Somewhere in the recesses of our mind there should be an inner knowing that directs us toward an expected end. And if you’re here today, then heaven is your expected end. After I got saved in jail, I knew I would be a minister. I just felt that I had a call on my life. I can’t really explain how I knew I just did. I mentioned to my girlfriend, at the time, that I was feeling a call and then the same evening at church a friend from softball told me that I should go to Bible College, and then a month or so later Mario Murillo sealed the deal with a word of prophecy. I can’t say everything I have encountered in my life pushed me toward my destiny. On the contrary, there were sharp contradictions as I went through my storied journey. Today, I have an inner knowing, it’s hard to explain, but looking back, I recognize that my experiences are riddled with God’s guiding touch. 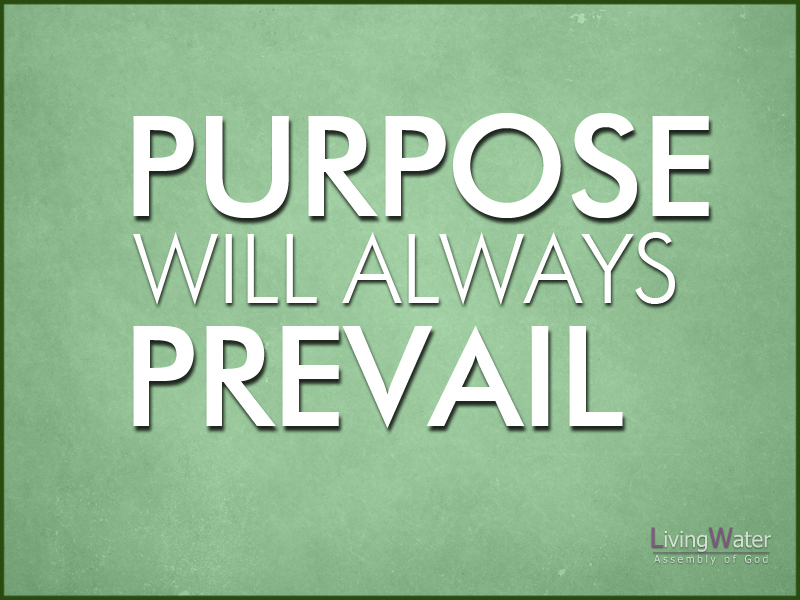 I want you to know that even if circumstances contradict purpose, purpose will always prevail! God has a plan. Take your hand put it on your chest, feel that, that’s purpose. If the fulfillment of the prophecy was without obstruction, we would assume we had merely received a lucky break. It is the opposition that clearly demonstrates to us that God is working. When all indicators say it is impossible and it still happens, then we know that God has done it again!! Around here, it’s not luck…it is faith. Jeremiah 29:11-13, For I know the thoughts that I think toward you, says the Lord, thoughts of peace and not of evil, to give you a future and a hope. 12 Then you will call upon Me and go and pray to Me, and I will listen to you. 13 And you will seek Me and find Me, when you search for Me with all your heart.